Target versus Trader Joe’s. Who ever thought the world would come to this? An updated note. On a recent trip to Target this was priced at $2.59. Either I was wrong when I quoted the price below, or Target had the wrong price on the product. Regardless, even at double what I thought the price was, this is still a good value. It’s just not as good a value as when I thought it was half this price. I’ll correct the price below for future readers. That’s right, Target, as in, Target the big discount department store. Headquartered in the far north, the descendants of Erik The Red ventured across the world to India. They came back with Indian-inspired cuisine in a cardboard box. That invites a comparison between the upstart and Trader Joe’s, where we’ve come to expect multicultural food choices. 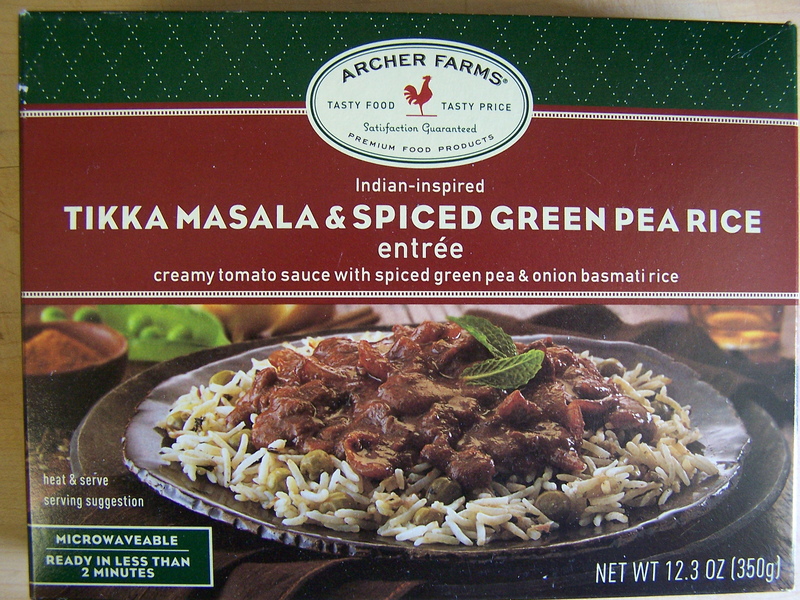 Here goes, a comparison between Target’s Indian-inspired Archer Farms Tikka Masala & Spiced Green Pea Rice (entrée) and Trader Joe’s Indian Fare lineup. Target gets the price and packaging right. The price is difficult to believe (in fact that is correct, see note at the top and next sentence). While I thought I had originally picked this up for $1.12 (on sale) it was $2.59 on a recent trip. Similar Indian Fare at TJ’s goes for around $2. Target also gets the prize for calories, 740 per box. According to Target, that’s two servings. Of course, I did, and you are likely to, eat the whole box. So perhaps a few too many calories for one person, but maybe not enough for two persons. 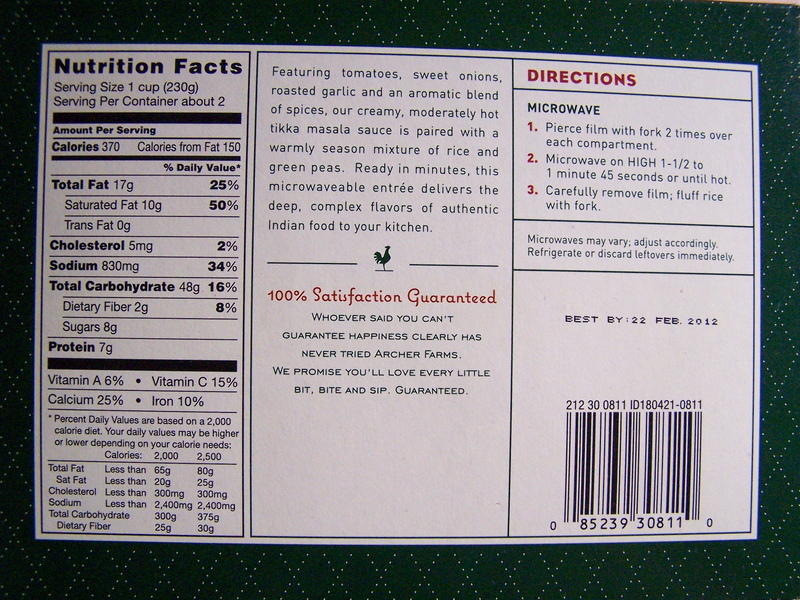 TJ’s Indian Fare runs in 300 to 400 calories per box range. 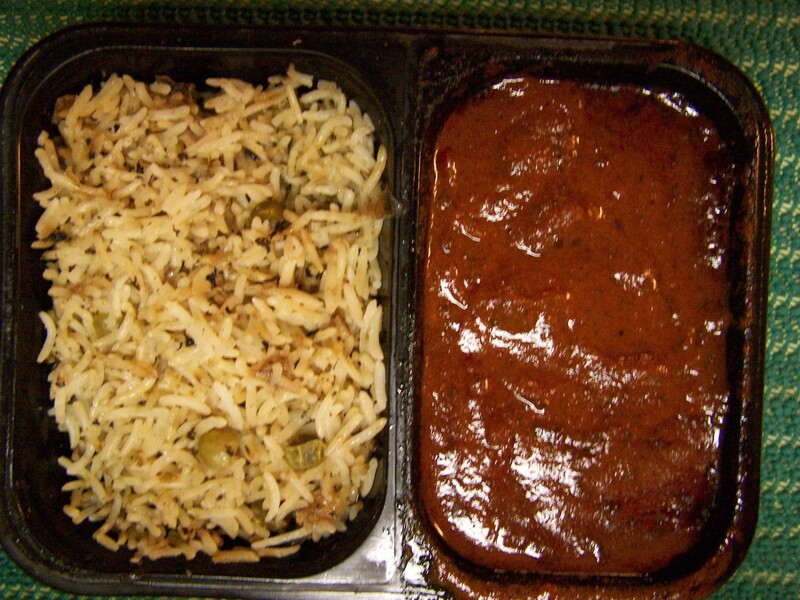 In a single Target package, is a divided plastic tray with basmati rice on one side and, what I’ve referred to in the past as, Indian marinara (masala in this case) sauce on the other side. TJ provides neither a suitable “dish” to heat and eat out of, nor the rice in their Indian Fare. This puts Target way ahead in convenience as either an office lunch or a quick home meal. Both this Target product and the TJ Indian Fare store at room temperature through the marvels of modern canning. Both heat up quickly in the microwave. But, what about the taste? As you guessed, there has to be a down side. Target labels this as “Indian-inspired”. And even though the box says “Product Of India”, the inspiration part falls short. The rice is acceptable. But if I didn’t know this was basmati rice, I would’ve thought it was regular long grain rice. There wasn’t a whole lot of that nutty characteristic that basmati rice usually has. The sauce sitting next to the rice in the tray also lacked those different flavors that we expect from Indian food. While the ingredient list seemed to contain all the things a nice masala sauce should have, in the end, the flavor just wasn’t there. 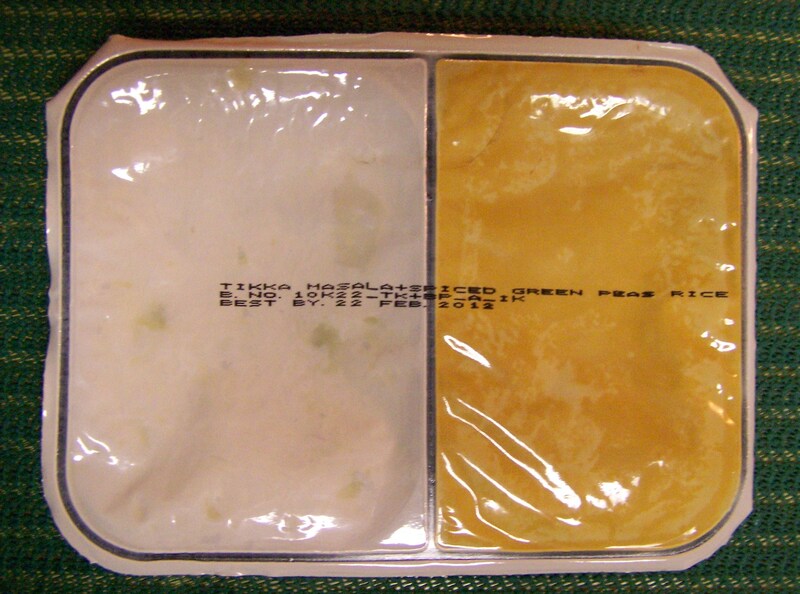 In fact, there was actually a little undesirable taste to the sauce. If you’re looking for any degree of heat, bring your own cayenne with you. My tongue detected no heat at all. In summation, Target has everything right except the taste of India. It’s still an acceptable quick meal for work or home, but it won’t satisfy your craving for an Indian eating experience. In my cabinet is a box of Target’s Coconut Curry & Rice. We’ll see how that tastes soon. This entry was posted on 07/23/2011 at 12:36 and is filed under Recipes, food, cooking and related items, Trader Joe's. You can follow any responses to this entry through the RSS 2.0 feed. You can leave a response, or trackback from your own site.